What do the stories youth in state care tell about life in their family of origin? What stories do they tell us about coming into care, living in care, and relationships with foster-parents and social workers? This book presents the stories of youth in care, though not in splendid isolation, but as interactively produced, turn by turn in interviews, and in conversations with other youth. 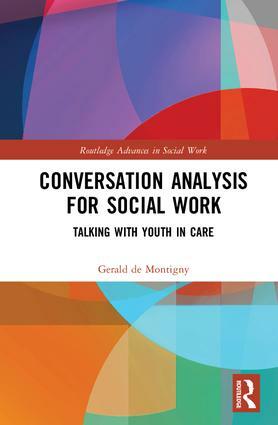 By using tools from conversation analysis (CA), the author examines interviews with youth in care and social workers, to unfold the essential and incorrigible reflexivity of story production. CA allows us to grasp the ways that a youth’s story emerges turn by turn, and is an artefact of a social relation between a youth and an interviewer. This text provides social work readers with a sense of art, artistry, and ambiguity at the heart of social interaction. It will be required reading for all social work students and academics looking for a deeper, more philosophical understanding of the profession. Gerald A. J. de Montigny grew up in a proud working class family, with parents, Monty and Betty, who supported his socialist activism. When still 19 he met Andrea, who remains his partner and love, and together they have three adult children, Brendan, Julia, and Sarah. With a MSW completed in 1978, he worked in child protection, mental health, and forensic psychiatry, and began teaching social work in 1985. Gerald uses a Marxist materialist analysis which begins with people’s living practices and social interactions, as bringing about their experienced worlds. He was fortunate to have studied with Dorothy Smith and Mary O’Brien, both second wave feminists.